In Indonesia, corruption is a major problem. People are busy trying to find an effective solution to stop corruption in the “higher level” such as in the government or in big companies. However, not many people realise that corruption starts from an early age due to lack of education from the environment or within the family. 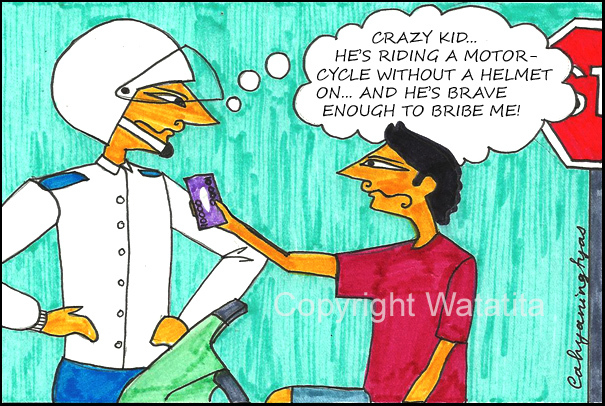 My mother remembered that once she saw a young boy, about 8 years old, riding a motorcycle – without his helmet on, and when the police stopped him, he quickly grabbed some money to bribe the policeman. What went through my mother’s mind were two things = why did his parents let him drive that motorcycle – without a helmet, and who taught him to bribe at such an early age? Cheating at school is also something that could lead to corruption. So it’s not only in the government or in big companies. Even having a fake drivers licence is a form of cheating which is similar to corruption. If Indonesia wants to stop corruption, we should stop just looking from the top, but start concentrating on problems at the bottom as well. We should look into our bad habits. Now, corruption is a part of our culture. It is that bad. Please don’t teach children how to cheat, teach them how to work hard, teach them how to do their work properly. No matter how much of a small deal we cheat, it can lead to behaviour which can disadvantage so many other people. A lot of people out there still think that art classes at school are just “playing around”, or not as important as other subjects. I’d like to remind everyone that art classes are not just “playing around”, but art helps to develop your child’s right brain. Creativity is very important for children, so they can grow up into thinkers, not followers. With a creative mind, children can create something different. They don’t have to end up being an artist, however creativity is essential for jobs in business, law, engineering, politics and many more. If a child is intelligent, but with no creativity, he or she would be able to finish tasks properly, but wouldn’t be able to create or start something different. People who created Facebook, iPod and other millionaires have creative minds. In the future, the world will be lead by people who have creative brains. To sharpen your children’s creative mind, please visit Abrakadoodle. It’s a program with a perfect mix of art and education, based on the US curriculum for ages 20 months to 12 years old. In Abrakadoodle, children will learn how to be creative, innovative and confident. For parental tips on how to encourage creativity with children, please visit the blog (in English). Education is very important in our lives. Unfortunately, Indonesian education is not at the maximum standard, and not everybody has the access to education. However, it is really frustrating to see privileged children who are in school taking education for granted. They protest every day on how much they hate learning or going to school. Many of them can’t be bothered doing their homework, and not many privileged children have the will to achieve something great academically. On the other hand, children from financially struggling families want the luxury to be able to go to school. 1. Low quality facilities and infrastructure. People are so busy building shopping malls, not proper school buildings. Many bad quality school buildings in isolated areas and smaller towns of Indonesia need attention from the government. Every area in Indonesia needs a proper library where children can read, even in their spare time. 2. Low appreciation of teachers. Teachers here aren’t happy enough, they have to work for a low income. Plus, sometimes they have a big burden of teaching 40 children in one class! Therefore, some teachers don’t have a professional attitude. 3. Access to education is not evenly distributed around the country. Isolated areas in Indonesia still have minimal exposure to education. Education should also be made available for everyone from all financial backgrounds. Has the government really been spending the budget (APBN – Anggaran Pendapatan & Belanja Daerah) for education wisely? 4. The subjects taught in schools are taught in the most uninteresting way… ever. Juuuust memorizing. That is all we do at school. There is a better system to teach children so they can be more interested in the subject they are learning, and get them to learn better. Just memorizing is not going to teach them anything, learning with practical activities will help them understand the subjects better. But for those who have the luxury to receive education, please do not ignore the importance of education. There are so many people out there who would work hard for education. Education gets you jobs, and knowledge. This country would thrive if the people are educated so they’d have more open minds, so that they’d be more creative, more systematic and more useful for this country. Rather Than Watching Too Much TV Shows, Let’s Read! Lately, I’ve discovered peace when I read. Reading transports me to a whole new world, even though I don’t like reading fiction. I prefer reading non-fictional books, or something that is based on history. The most fictional books I read are the ones that are based on mythology and culture. I’ve been reading a lot lately, which is why I forgot to update this blog, hehe. Ever since technology started to develop rapidly, people, especially the younger generations would rather watch TV or play video games. Even when they read, they read magazines. 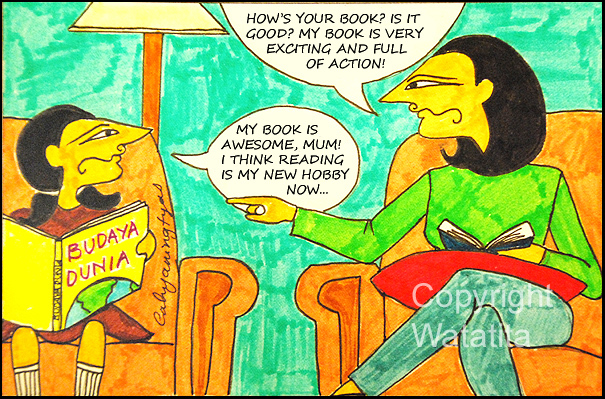 I didn’t use to like reading, not until I got into tertiary education, then I started to appreciate reading. My university had a good library, big and complete. Books are the window to the world and the source of knowledge. Rather than watching too much TV and playing video games, let’s read instead. Knowledge is a treasure. Accumulate it, soak it up, and don’t ever leave it behind. Your Child Doesn’t Need to Get A+ For Everything..
You HAVE to be at the top of the class!! I’m not a parent. I’m still young and I don’t have a child, so maybe a lot of parents out there might be annoyed by this post. But I just want to express my opinions. Ever since I was young, I’ve always met parents who force their children to get the highest marks at school. They don’t care how, their children needs to be at the top of the class. There is nothing wrong with parents wanting their children to get the best, but it’s not good to force them to do things that is beyond their abilities. I’ve been lucky to have parents who never forced me to be at the top of the class. They only motivated me to do the best I could. If I could only get 70% for Information Technology, and I’ve already tried my best, they wouldn’t get angry. Every child has their own potential and ability. Even though my mathematics wasn’t that great, I had good marks for my history, social studies and art subjects, because that’s where my abilities are. It’s even worse when parents compare their children to other children. “Why can’t you be like this kid, they got an A for this subject”. Big NO NO. Please remember that they have their own talents and potential. Parents who force their children to take the parent’s choice of university course are also annoying. 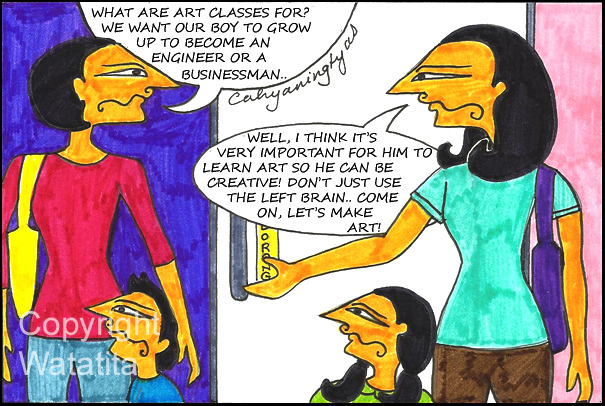 Some parents prefer their children to take law, medicine, engineering (prestigious courses which creates more potential to earn more money) when their children wants to study photography, anthropology or literature. However there are also parents out there who know their children’s potential better than their children do. Hey! Don’t Copy My Answers! That’s Cheating! I admit, I used to copy my friend’s answers when I was at school. But I also admit that I was wrong. I used to copy my friend’s answer because I didn’t feel confident with myself.. mostly because I didn’t pay attention to the teachers when they were speaking or forgot to read over the material when I studied at home. Until one day, someone else copied my answers. I felt so angry, because I’ve worked hard to study and understand that topic, but someone else easily copied it. 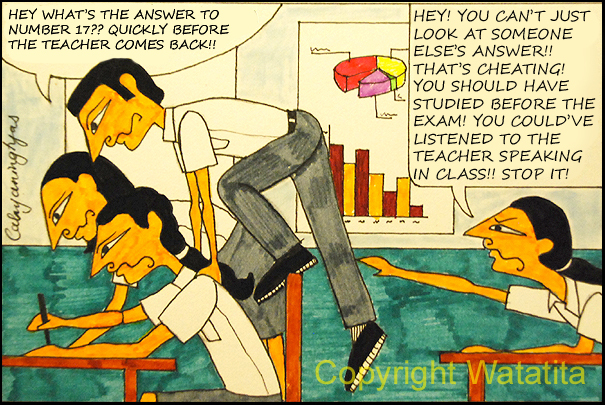 Copying someone else’s answers during an exam or a task is cheating. Like I said, people who copy answers are people who are not confident with their own knowledge. Even though we all know, when we listen to our teachers speaking in class, we don’t need to copy answers when they give us tasks or exams. To those who are still in school or at University/College, please try to finish your task/exam by yourself. Learn how to respect other people’s efforts, people who’ve actually tried to learn and understand the subject. Respect your teachers too, please pay attention to them. If we pay attention, we wouldn’t need to copy our friends’ answers. Let’s erase this bad habit! Kids.. 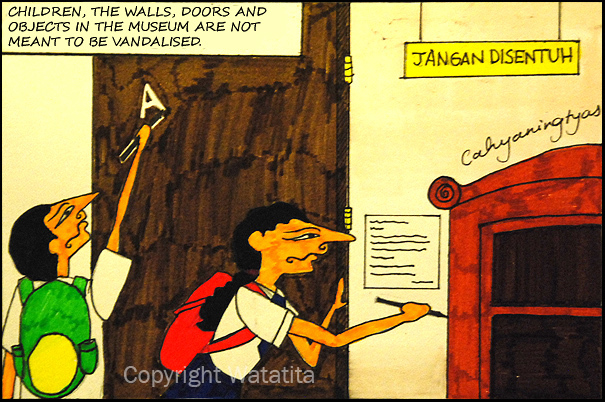 The Walls, Doors and Exhibited Objects in the Museum Are Not Meant to be Vandalised! Children, you're not supposed to write on the walls! I enjoy photography as well as drawing. A couple of my friends and I went on a day trip to North Jakarta’s Kota Tua (Old City) for photography hunting. The first museum we went to was the Fatahillah Museum. The building was beautiful, I am a sucker for old colonial buildings! When we were there, a lot of school children were also there for a field trip. However, it didn’t seem like they know what they were doing there… They were taking pictures of themselves with their mobile phones, flirtingwith their girlfriends/boyfriends, gossiping.. But what irritated me the most were the children who vandalised the museum! They were writing on the walls, the doors, and even on the exhibited objects! When I arrived in the museum, I already noticed writing on the walls, doors and the exhibited objects and I thought those were writings from people a long time ago, but – apparently not! They’re still doing it, and they were doing it in front of my eyes! I met this junior high school student who was busy writing on the door.. with a white-out! Now, how can I not be angry at the kid?? So I told him off politely. I said “Excuse me, but please don’t write on the door, this is a public space, and supposed to be protected and preserved.” His answer was stupid. He said “Don’t panic, it’ll disappear, it’s just for fun”. Oh… my… Goodness. WHAT have they been teaching you at school? Is this the reflection of the education system we have in Indonesia?? The whole museum looked like it wasn’t well looked after. The explanations of the exhibited objects weren’t even complete. Most of them were only printed explanations, laminated and stuck on the wall by double tape. It was pathetic and heartbreaking. It was actually understandable why children would write all over the place, because the museum looked unmaintained in the first place! Very different to the Wayang Museum we went to next. The place looked clean, well maintained, therefore children weren’t bold enough to vandalise the place. Mr. Jero Wacik (our Minister of Culture and Tourism) .. or anyone who will become the Minister of Culture and Toursim in the future… PLEASE DO SOMETHING! Banner Disaster in Indonesia’s Biggest Cities..
Spitting in Public Spaces – A Disgusting Habit …….. Just.. EW. The Indonesian Movie-Goers’ Ultimate Nightmare.. Say Bye Bye to Hollywood! Sidewalks are for PEDESTRIANS, Don’t Tell Me To “Get Out Of The Way”. I'm Not Full Yet, I Haven't Eaten Rice!